A book detailing the Mudge gonga Community Quilt Project is now available. Learn more about the project and how to order the book. 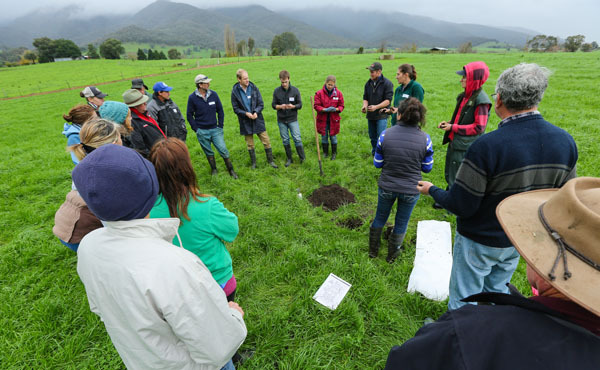 The Minster for Agriculture and Water Resources, the Hon Barnaby Joyce, yesterday announced that farming systems groups, community groups and individuals can now apply for grants of $5500 to $55,000 under the new National Landcare Programme Sustainable Agriculture Small Grants Round 2015-16. The grants complement the delivery of the Agricultural Competitiveness White Paper by supporting the resilience, competitiveness and productivity of Australian agricultural and fishing industries. It is expected that the Small Grants Round will have a positive impact on farming systems groups, community groups and individuals, enabling them to increase industry capacity and support the adoption of productive management practices, while maintaining or enhancing the natural resource base. Please find attached invitation to the inaugural AGM for the Into Our Hands Community Foundation to be held at the Savoy Club on Friday 29th November. On Monday, November 18th the Into Our Hands Community Foundation, Alpine and Indigo Whole of Community Landscape and Static Water Committee, Dederang Reserve Committee and Kancoona Quilters Group were awarded a High Commendation by the Minister for Police and Emergency Services, Kim Wells in the Resilient Australia Awards program that recognises innovation in emergency management and community safety. Pictured: A few locals who attended (Terry Karis, Loretta Carroll, Jennette Howman, Ali Pockley and Cathy Sonnemann). We are interested in anecdotal or printed stories and photos or sketches about your district – early settlement and the journey over time to present day. 1. Stories about early land use such as Aboriginal land use prior to European settlement, stock runs, gold mining, etc. 2. Land use after selection & settlement and the development of farming eg. clearing of land, building, farming through to current day, soldier settlement, etc. 3. How the use of local timber has been vital to district development eg. for fence posts, huts, water troughs, horse carriages, sawmills, etc. 4. Development of community assets such as hall, school, etc. A membership renewal form has been recently sent out to all Mudgegonga & District members. We have kept the fee to $25.00 again for this year. If you are not a member and wish to join please contact the Secretary, Cindy Lucas at trevor-cindy@wn.com.au or call her on 03 5753 4539 and she will send you a membership form.